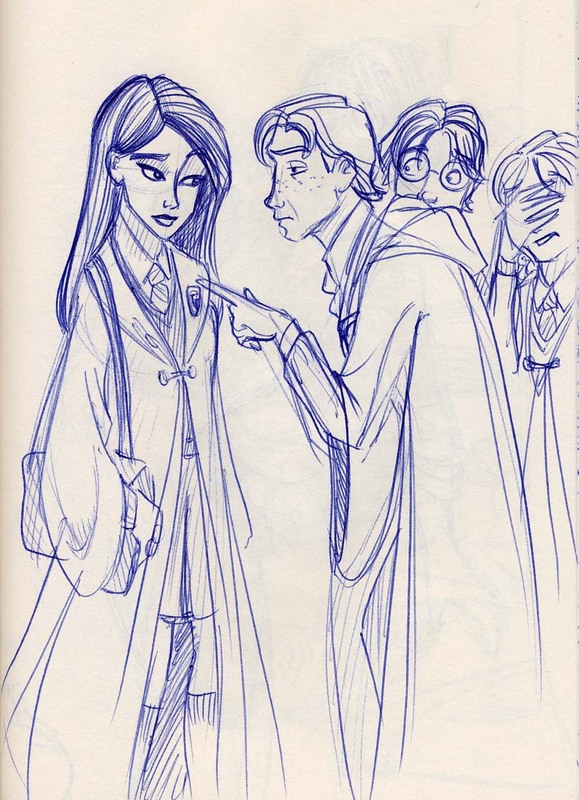 Description : I like Hermione's "Oh brother" look in this drawing. Hahahaha... Ron and Hermione's faces are priceless! lol, that's HILARIOUS! That's EXACTLY how I pciture cho. Nice job! Good job drawing Cho, she looks very pretty, and Percy looks incredibly annoying! Perfect! Silly Ron. Doesn't he know that tornadoes don't have anything to do with fair weather? ^_~ Heh, sorry, I couldn't resist. Anyway, very cute; I love Hermione's expression. Great job! Cho is beautiful! She has that politely annoyed and confused look on her face. Expressions are definately one of your many gifts! I love how you catch these scenes in the middle. I can see Hermione grabbing Ron arm, take him away and keep occupied for enough time Harry needs. Cho certainly looks the part of the gorgeous prep. Wow. She'd be a prom queen for sure. That is funny, funny, funny! Hermione looks so exasperated (at least, I think she does, I can't see her face, obivously) and Harry looks sort of scared. It kinda looks like he's poking her you know where. Sorry but I just love the expressions, especially Hermione's. Where? On her shoulder? Or perhaps at the badge that is ever so obvious pinned to her robes? wow, best picture of cho ive ever seen. im impressed. good job.. keep up the great work! ure really good at drawing girls. ron- has completely zoned out and is absentmindedly saying what he thinks, i wonder if thats why hermione fell in love with him? I really like cho in this one.